Write a caption for this photo and you could win a year's subscription to Threads magazine! As Halloween gives over to the Day of the Dead, so comes the official end of the CraftStylish Caption Contest. Thanks to all of you for your witty, knitty captions. 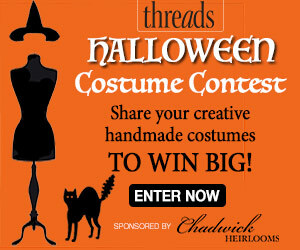 Stay tuned while we take our pick from the list and make someone a Threads magazine subscriber! Look at the skeleton we found in our closet! We wish we could say that this photo was taken for a Halloween issue of Threads magazine--but no, this project ran in the February 1992 issue and was intended to inspire knitters to make winter ski-masks! Sixteen years later it looks like a DIY freak-show and it is our number one choice in the 'what were we thinking?' category. In hindsight, we don't know what is more frightening, the project itself or the fact that it made it to print? If you feel somewhat taken aback upon initial confrontation with these masks, give them a chance. Just wait until you knit one and crawl inside; you will feel positively transformed. At the end of the day this projects reminds us not to take ourselves too seriously. After all today's great idea might seem insane sixteen years from now. Post a caption below for this photo by 11:59pm October 31st. We'll pick the one that we think best captures all that this picture encompasses. The writer of the winning caption will receive a year's subscription to Threads magazine. irishwings writes: "Do you think mom will recognize which one of us took the pie?" Lorelei7 writes: Sometimes you've just gotta let your skeins go scary and have a little fun! lynne153 writes: "FRIGHTFUL FAMILY SKI MASKS" is my entry. Critters writes: "Really, Herman, a BOW tie for the family portrait? You know they make you look like a geek!" licensetocut writes: "She finally figured out a way to keep them from burning their faces while smelling the delicious, freshly-baked pie. She only forgot about the fingers..."
Lorelei7 writes: Warm. Enjoy pie & worsted your way. happipeanut writes: "The Ski-hoods Family Portrait"
Jen1964 writes: So I see you've met the rest of my family. Jen1964 writes: This reminds me of the little fellow who got unusual knitted gifts from his aunt, I believe it was the movie a Christmas Story... and one year it was a pink bunny P.J. suit, because for some reason she always thought he was a little girl. There are magazines that recommend you take a photo of you wearing "it," and send it with the thank you note... then donate the item quietly. It never hurts to be compassionate. Still I wonder what mom-in-law did with the sweater I knitted her, years ago, since I've never seen her wear it, and my daughter might fit it now, and loves those colors. Lorelei7 writes: Is it "Warm head-cold heart" or "Warm heart-cold head"? I can never remember. Jen_W writes: We bought all of our Christmas gifts--including these ski masks--instead of making a single one. We're not fit to show our faces. SewistStLouis writes: The winners of the "Make it with Yarn" pie contest are (clockwise from left) Slip, Purl, Bobble, and Skip Knitman. Woolie writes: "American Got Itch"
fashionista29 writes: Can we rob the bank next time instead of the bakery? Sew_n_sew writes: Not the kind of close-knit neighbors you need next door! Lorelei7 writes: Knitting is not just for normal people anymore! mamatrout writes: "Ahhh Mom, Billy is the only one with the zit, why do we all have to wear these masks for the Christmas picture?" margknittinaround writes: The Knitty McWicked Family, of Knitalong, PA wins pie contest!!! fatewineroses writes: A local vampire family out for an afternoon photo shoot. fatewineroses writes: The newest in mummy fashion for all family members is shown above. AlwaysKnitting writes: After viewing the photos from this summer's trip to her sister's, Jane finally realized the extent of her obsessive-compulsive disorder. lauraflora writes: Everyone is being wickedly funny - but, did anyone ever think if the original author of the article (and yes, I remember it too, have it in my stash of mags,) saw that she was being made fun of? That Threads picked her article out as a "What were we thinking of when we printed this article?" Would she take it in fun, or cancel her subscription? Would she feel insulted? Yes, when I first saw this years ago, I too thought it was odd, and maybe she has realized that herself, in hindsight. But, I think, this whole idea of Threads choosing "What were we thinking?" articles is a rather risky endeavor that is sure to offend several of their contributors. Sorry to spoil anyone's fun, but I think they should rethink what they are doing. AlwaysKnitting writes: Would you like a piece of our "special mushroom" pie? AlwaysKnitting writes: Henry and Betsy are beginning to doubt their decision to send their children to private school. It's turning them into little monsters. funmom writes: The only thing better than apple pie. Homemade knit ski masks, the gift that keeps on giving. Critters writes: Legendary family of masked professional wrestlers relax at home. bkristl writes: Merino and Gabby Melton, shown here with their two children Al and Mo, don't mind sharing their names along with their newest invention – identity disguising knit faces. "I just feel so bad for all those poor people being hunted by the mafia and all," said Merino. "I wanted to find a way they could comfortably and safely live wherever they wanted to." Gabby added, "and the best thing is that if they get tired of one look it's simple as pie to have a new one!" Pressed for comment, Mo, modeling the gray Emergency Knit, told us that his favorite thing was being able to enjoy Mom's homemade apple pie without a napkin! trickiwoo writes: At last! Facewear that would make Hannibal Lector jealous!! grahammy writes: Family poses with mom"s championship pie on a "BAD HAIR DAY'. 0ne_Nita writes: Meet the cast of the new series "The Knitheads". This family is from the YarnGalaxy. Their attempt to take over the nation starts in their new neighbor"hood" where they try to "hood"wink everyone with the all-american favorite, Apple Pie. As you can see in the photo, the youngest Knithead is zapping the pie with invisible "fibers". These "fibers" cause anyone eating a piece of pie to rush to the local yarn store (owned by the Knitheads) for knitting needles and yarn to make their own unique head"hood". "Hi, We're your new neighbours!" doglove writes: Next time, Ma, knit bigger mouth holes! knitwitty writes: Mom says: "Oh dear, I can't believe I forgot the knitted pie cover.....I feel so exposed!!!!!" knitwitty writes: Has anyone seen Fluffy? I knew I should have knitted bigger eye holes for him! knitwitty writes: Mom says to kids: Stop making faces at the camera you two! Dad says: Keep doing it, and your faces will stay that way...trust me and your mother we know from experience!! knitwitty writes: ......When knitting goes bad...REAL BAD!!!! knitwitty writes: Son says: Mommy, why are all these ppl staring at us? abl0nd2nd writes: Aren't you just curious? Even just a knittle bit? Critters writes: What're YOU lookin'at? suba writes: We are the KnitHeads. We are from France. KLSka writes: Now THIS is a close knit family. kbanger writes: This is what happens when you have bedhead and pizza faces from eating too much pie. Moonhonu writes: Dear Editor.... i have to smile every time i see your name on the pages here as my husband is Michael Murphy, smile! Moonhonu writes: The true family behind CraftStylish! Moonhonu writes: Knitwits family values! it if I don't keep my shoulders really straight. Can we take that Yank Tempter off the left ear, please? EstherP writes: Once upon a time, Lensley Camera met Charles "Jaws" Breaker. They fell in love and wed. Mr. and Mrs. Camera-Breaker have two delightful children. EstherP writes: No, mom. I swear. I'm *NOT* giving the pie a 'thumbs down'. EstherP writes: Hand over the ice cream and no one gets hurt. EstherP writes: Reduce. Reuse. Recycle. A too-small Aran with moth holes becomes a ski mask. FallingStar writes: The Knitastic Four! ALantain writes: Sure, you laugh now, but Halloween in Canada can get awfully nippy! "AND OH YES, THIS WAS THE YEAR MOM LEARNED TO KNIT, LUCKY US!!!" CreativeWhimsy writes: Hey Mom, this IS better than the paper bags you made us wear last year! fozie writes: "Oh, I HATE it when Mom decides it's time to clean out her stash!" irishwings writes: "The Brandy Bunch has nothing over this close knit family!" hclehnig writes: Don't be afraid, you won't get hurt, just give us your pie! sewgirl56 writes: The secret's in the recipe. BarbaraPenn writes: "Don't get your yarn in a twist! We're just here for the pie. funmom writes: Nothing warms the heart more on a cold day better than hot apple pie and a homemade ski mask. funmom writes: And you thought your family was strange! SueinNE writes: They say it's not contagious,. so we brought you this pie! SueinNE writes: Just a bunch of Knitwits! In a twisted effort to conceal thier identity, the Jones family is accused of stealing the Three Little Kitten's lost mittens and Mother Cat's apple pie in a pathetic effort to win the pie baking contest at the local Fall Festival. SewQueen1 writes: Hell Demons escape,Be wear. Mortira writes: "The Slasher family was very closely-knit..."
"The family that slays together, stays together"
PS: I think the creepiest thing about this photo is the boy with his finger in the pie, as if to say "We're coming for your pastries!" SewinUpAStorm writes: Do I want a recipe for what kind of pie? rosemaryschild writes: "Sock It To Me"
jamye writes: Help! We're supposed to be baking, and we just can't stop knitting. lizbeth4973 writes: The Smiths are back from the circus and they brought us a pie! lisha writes: Put on your killer ski mask I made! It's freakishly cold outside! Boca_Jan writes: Ladies and gentlemen, I'd like to introduce you to the family of Joe Knitonepearltwo. Boca_Jan writes: Maybe when the economy improves we can get real plastic surgery. These mask are coming for you. Pick the Pie up off the floor. This is how we get our kicks. We Like to sleep in late. We're here to SPOOK you again. which includes from left to right; Pointdexter,Zeborah,Derby and little Ronnie, affectionatly touted as,Mopsy! Alexandra writes: "Yes Johnny, Mrs. Clikkit is baked into the pie." CatherineCornelia writes: Delivered fresh to your door from the Alien Bakery, homemade apple pie! fisheye3 writes: "Just because my casserole made everyone sick at the last Neighborhood Potluck doesn't mean we can't hold our heads high and bring them this lovely pie!" MyCrochetCellar writes: Mom got us addicted to her apple pie, so it's all her fault that we are all just a bunch of apple-pie loving knitwits! DIMAC writes: Meet the Skimask family. They are the winners of the "2008 Most Closely Knit Family in America". They are (from left to right) Zebranna, Mimeman, Coneheadra and Greyson. XtinaS writes: No sudden moves...we have a pie. Hand over the candy and no one gets hurt. chickapee1 writes: MOM ! He's touching it again ! chickapee1 writes: i told you it was hot - now smile for the camera ! Jaxgirl writes: Thanks, Grandma, we just LOVE our gifts. DIYMaven writes: Casting agent to her assitant: "I said, 'Family Affair', not "Family of Fear!" EstherP writes: Aunt Esther, we love you dearly. We thank you for knitting such fantastic creations so lovingly for us. But... since these were supposed to be sweaters, we think you need to take at least one more knitting class. We're pitching in our allowances the whole month of November to pay for it. Love from the kids. MnKidAtHeart writes: Agnes, did you have to wear the stripes? Couldn't you have worn your "good" mask for the family photo? knitwitty writes: You should see how our house is decorated!!!!! MnKidAtHeart writes: On three, everyone smile for the camera! one, two, three.......is everyone smiling? nadine6977 writes: This is why you should never mix knitting and baking kids. nadine6977 writes: Knitting, not one of mom's better talents...but her apple pie is to die for. 5onCover writes: From the child wearing the white "ski mask": "Just because my mom CAN knit something, doesn't mean she SHOULD!" 5onCover writes: No thanks, I'll pass on the pie for dessert. Lorelei7 writes: See the new blockbuster movie: "Knitmare on Elmstreet"...it'll haunt your dreams! IThrowCats writes: Michael, Paris, Prince "Blanket" Jaskson, and an unidentified friend at the Neverland Ranch on Wednesday. Fromaggista writes: Famliy of Four Missing! The Johnson Family of Anywhere has been missing for 3 months. Though the Anywhere Police Department is not releasing many details, it has been announced that the family was initally reported to have been brutally attacked in their home. Only later did we learn that the "faces" located throughout the Johnson's Home were just ski masks that Mom Johnson had knitted for the family. The Anywhere Police Department asks that you contact them immediately with any information to their whereabouts, and have released the most recent photo of the Johnson Family. cykel609 writes: Mommy,why didn't anyone want a piece of our special halloween pie? MrXStitch writes: Michael Jackson's latest family portrait went for the "homemade apple pie" theme for 2008/9. The_Kids_Are_Alight writes: If only the neighbors could see what was UNDER their marks, then they'd really be worried! Handycam writes: The pie was worth the time in the burn unit. CookiesMommy writes: In an attempt to "go green," Community Hospital has replaced our plastic surgeon with a wool surgeon. Handycam writes: Nothing perked up the Barrow gang like Ma Barker's apple pie. lorchick writes: hey, maybe when granny chic goes out of style, creepy-chic will be in... lol. myyellowhouse writes: We're looking for Kirk! Jen1964 writes: Ma Barker's family Christmas photo? ChrisCasey writes: "Hand over ALL the pies and nobody gets hurt!" AmericanCurl writes: The Aliens next door really took to American cuisine...they loved apple pie so much they included it in their Christmas photo. 247kath writes: Mom, it's not cooked - it bit me. SharonAnderson writes: "Get your finger out of my apple pie Junior! Why can't you be more like your brother...he's founding a little after school club called the KKK." DingusMcPhee writes: The one thing that could always bring the Klan, Al Qaeda, The IRA and The Shining Path together was Mom's apple pie.